The list grows every year and 2019 is bigger than ever, and more of us are now competing abroad as well. UK Team just before launching on Lac de Lacanau, France at the Hobie Fishing Euro's. Who would have thought that one of us would be coming home Hobie European Champion. Not the first time that I have entered a boat competition. There is a lot to learn when fishing as a pair in a boat, and to be honest it makes a nice once in a while change. Martin Collison joined me for this event and we fished well together. We were late finding the fish, but once we had we were catching one or two on each drift, another two drifts and we might have been in on the prize table. Sadly we were out of time, but did well enough to get 5th place in a 34 boat field. This will mark my 10th year of involvment in the Classic and as such will be a special one off 2 day event. 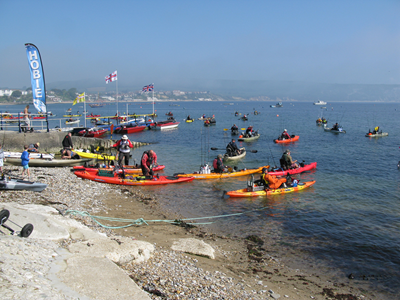 Day 1 will be the standard Swanage Classic species hunt format. Day 2 will be something special, a new format for kayak fishing, one I hope will be exciting and fun. Day 2 will also be a short format so that people can get away and home as I know so many have a long way to travel. So 2 days of competition, one entry fee. Dates for your diary are 18-19 May 2019. If you are a sponsor keen to get involved please send us an email, we will be very please to hear from you. 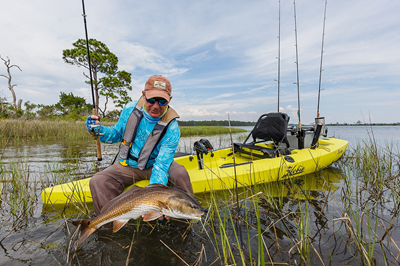 The Hobie Outback is probably the biggest selling fishing kayak in the world. Hobie surprised the world by announcing a completely redesigned Outback for 2019. I have been very lucky to have already been on one and they are starting to arrive in the UK as of this month. First thoughts are, I want one, for the type of fishing that I do it's near perfect, it's the complete package, very well designed and thought out. The seat seems to have a little more comfort which might be because it's a little wider. It has a lot more stability when standing than the previous Outback. There is also a lot more storage. A new rectangular hatch between your legs which opens lengthways so no need to shift a leg overboard to open it. The tankwell is wider, there are H-rails forward and aft which lay flat around storage areas, so she will still lay flat upside down on the roof bars. Here's a video walkthrough of the Hobie Outback 2019. Want to test one for yourself. Give Kris a call at the Hobie Centre, Poole 01202 671661. Just when you thought that Garmin's Panoptix was amazing technology they go and update it to LiveScope which is truly remarkable. Realtime viewing of the fish in front and below the transducer, one transducer giving you both views, not only one transducer, but a slimmer lighter transducer than the PS31 which it replaces. The image quality is amazing, you can see the fish, and most of the time you know what fish you are looking at, you can see them clearly, see them approach your lure, see them turn away, yeah I know that can be frustrating. The first time we got our hands on one to test we were using the new EchoMap Plus 95sv. A slim touchscreen with magic function keys. Very nice easy to use unit. With the screen dimmed a to 85% we were getting 6hrs of use out of our 22ah Tracer battery, we were pleasently suprised. We had this set up for the Zander Cup at Rutland so not permantely fixed in the kayak. 2018 Year of the Kayak Rack? 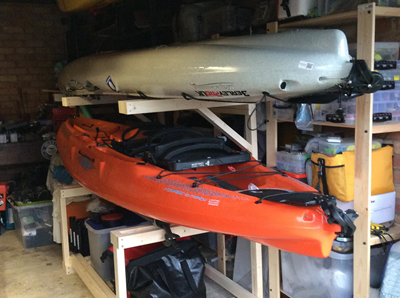 We have finally written up our build guide for a 2 kayak storage rack which is built on wheels so it can be moved around the garage easily. It was an easy build and not expensive to do. Take a look. Have also made a start on writing up how the Hobie Revolution 16 has been personalised and fitted out. More to come in the future. Check it out. It's been a very busy year. The Tournament scene is exploding in the UK and hopefully at some point in the future we will get a Tournament Series with a champion crowned at the end of the series. Hobie in Austrlia and the ABT do this so well with some serious backing of sponsors both in the angling industry and also others from outside. Sweden has already started a short series this year and I hope to be able to compete in one of the rounds next year. This year I have fished as many competitions as I was able, I missed two in Europe, both the WPC in Holland and the Hobie Fishing Euro's also in Holland, would have liked to have fished them both, but funding these competitions is becoming very tricky, more so when travelling solo when my wingman Ian Harris is unable to attend. 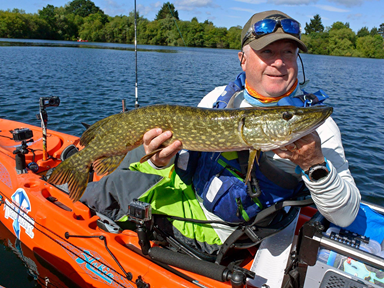 I became part of the new Garmin UK Fishing Team during the early part of 2017, and they have been amazingly supportive of everything I have done. It's been awesome using kit that talks to each other, all my Garmin kit actually communicates to the other bits, total control and integration. Did a bit of filming with the Garmin Team earlier this year, all being edited at present, hopefully will be able to share soon. Was a surprise to see Garmin buying Navionics, waiting to see how this partnership will grow in 2018. This year's newest event the London International went extremely well. Organised by Ian Harris we fished two lakes on the RK Leisure complex, Wraysbury 1 and Wraysbury 2. I started off well on day 1 with a new PB, a cracking 108cm pike, and also a couple of other pike to fill my pike scoreboard and finishing the day in 6th place. Day 2 was less successful with a blank and leaving me in 11th place but with biggest pike which earnt me a very nice Westin W4 rod. 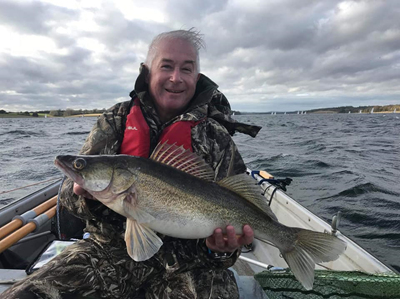 In October I was honoured to head off to China again for the Shengzhong Lake Kayak Fishing Tournament, again Day 1 was very kind to me, Day 2 less so. Such an exciting country to visit, we are treated like rock gods, and we acted like them once we found the KTV karaoke bar. Early this month we had the very sad news that one of our members and friend had died. Ben Saville was a friend that would always leave you smiling and made the world a better place, taken from us and his family to early. RIP Ben. This weekend the 10th December we will be fishing for the Ben Saville Memorial Cup in Poole Harbour, organised by Southern Canoes. 2018 looks so busy already. Lots of tournaments already listed, they all need your support. Huge thank you to my sponsors, Hobie, Hobie Centre, Garmin UK, Navionics UK, Fusion, Reuben Heaton, and Palm Equipment. 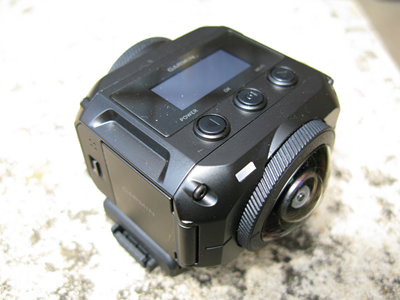 Managed to get our hands on the Garmin VIRB 360 for the OK Classic Kayak Fishing Tournament. With little time to read manuals we went with intuation, it was very easy to use, no need to put onto standby, just push the knob on the side of the camera and she starts recording. A pull of the same knob and she stops. You can also control through your smartphone, or smartwatch using Garmin Connect, I could have controlled from my Garmin 1022xsv, but I had a competition to fish so went for the quickest option. What's so special, well it shoots in 360 degrees, which is all around you, above and below. 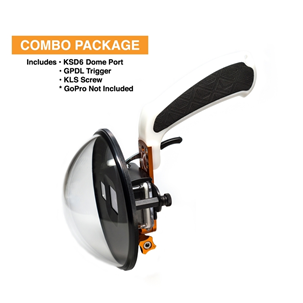 It uses two 180 degree lenses and stitches the frames together automatically, it's stiching is so good it's quite hard to find where it's stitched. 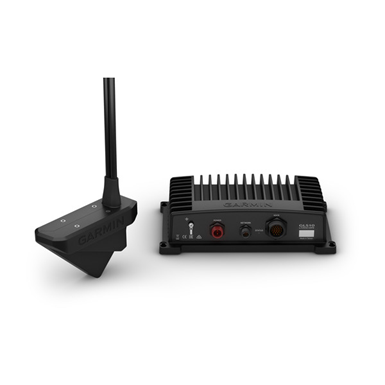 Sound is recorded through 4 directional microphones giving you all round sound. The Quality is outstanding, best uploaded directly to YouTube. Viewing is best on a mobile device, mobile phone or tablet. 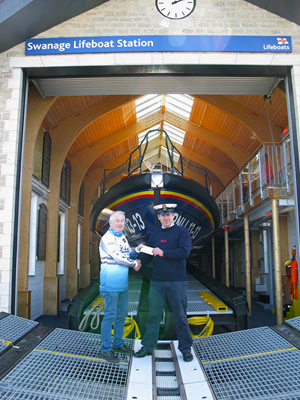 Finally managed to get down to Swanage to hand over a cheque to the Swanage RNLI Lifeboat. The new station is finished, the new boat is fully operational. It was perfect timing to get down and present the cheque for money raised from last years Swanage Classic. We raised £1050.78, well done to everyone involved. Our latest review has just been uploaded, the Lumb Bros Safe Fast Cut Knife, check it out. 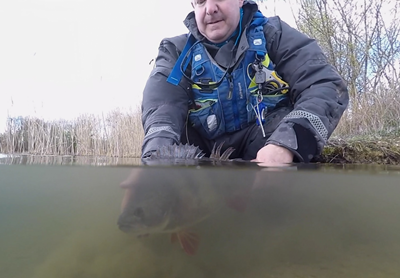 If you own a GoPro action camera and want to capture the ultimate photo's including angler and fish then look no further than KNEKT's GPDL KIT. We have been using the KNEKT products for much of the 2016 season alongside a GoPro 4 Black Edition, the only problems i have had has been with the GoPro and start up delays which has meant a few missed shots, my bad. The GPDL KIT is the perfect angle when shooting from above the water level. There are other models in the range for shooting from in the water, surf photography etc. The kit is superbly engineered, everything fits like a glove. The Dome does need a little looking after I keep the dust cover on at all times when not used and so far the Dome is still in perfect condition. 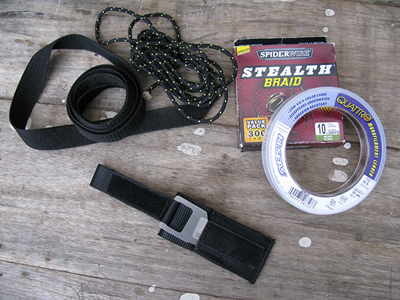 I'll be writing up a full review of the product along with a few photo's and video in the near future. 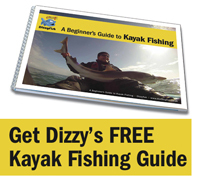 Why not have a read of our getting started guide here. 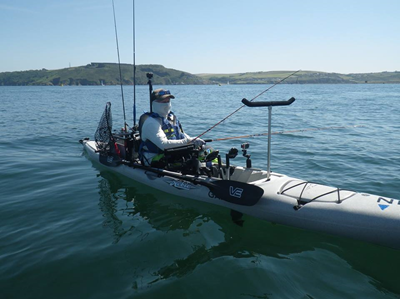 If you don't have a VHF Radio and think your OK with your mobile phone, you might like to read iCOM's recent article about the Importance of a Marine VHF when kayaking, check out the handsome chap in the photograph, then go buy yourself a VHF. At last a list of the most popular rod holders, mounts and rod leashes, we know that there are a few others to add to the list such as Fladens offering, but as yet we have not been able to get a photo or specific details, we will update as those details become available.